Between 1936 and 1939, around 2,100 British people travelled to Spain to fight with the anti-fascist for the Republic volunteers in the Spanish Civil War. A small monument, inscribed with the words "They went because their eyes could see no other way", sits on on the South Bank to remember them. Opinion differs on whether they were freedom fighters or communist stooges, doing the work of the USSR's Comintern, but they believed in what they were doing, and around 500 gave their lives in pursuit of what they believed in. 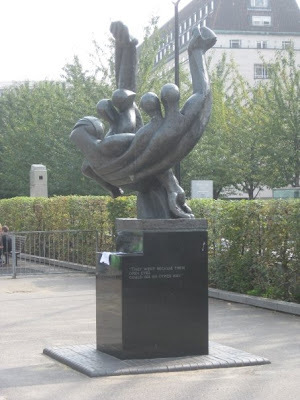 You can find the statue in Jubilee Gardens beside County Hall and the London Eye. 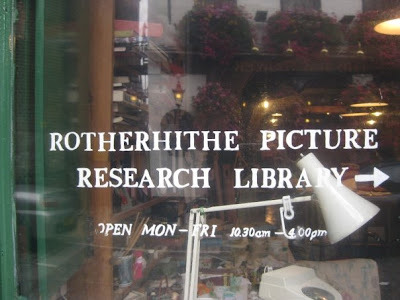 Rotherhithe Picture Research Library, in Rotherhithe, is an educational charity, opened in 1976 as part of Sands Studios, and situated in the same Grade II listed building. The library is home to thousands of old photographs, postcards and magazines. Pictures are classified by themes, countries and historical periods, to enable researchers to find what they are looking for, and the library is open to the public every weekday from 10am until 4pm for free (though there is a charge for photocopies). The building at 119 Rotherhithe Street, in Rotherhithe. For more information, visit http://www.sandsfilms.co.uk/Rprl.html, or see this fantastic article on Londonist. 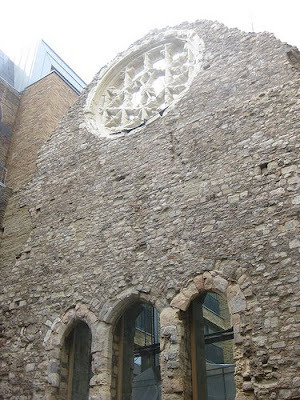 Built in the twelfth and early thirteenth centuries, Winchester Palace, in Bankside near the old Clink Prison, was the London residence of the Bishops of Winchester until the 17th century. At the time it was one of the largest and most important buildings in London. After the Bishops moved out, the Palace was divided into tenements and warehouses, and it wasn't until the area was badly damaged by fire in 1814 that aspects of the original stonework re-emerged. What remains was restored as part of the redevelopment of Bankside in the 1980s, and remains exposed with the help of English Heritage, as a memorial to the great palace which once dominated the area. You can still see the Rose Window, which was part of the Palace's Great Hall, and the three doors to the buttery, pantry and kitchen, pictured above, from a viewing point on Clink Street. 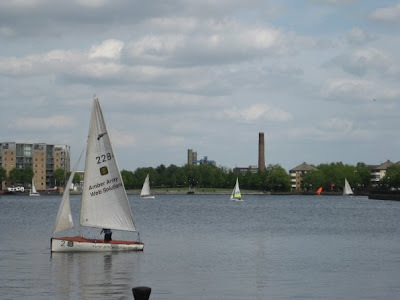 Opened in 1989, at a cost of £1.2 million, the Docklands Sailing and Watersports Centre aims to provide recreational water activities for all sections of the community living and working in Docklands. Owned by the Docklands Sailing & Watersports Centre Trust, and maintained by full time staff and volunteers, the centre offers a range of adult and youth courses, open sessions and powerboat courses throughout the year. Unfortunately, the programme of Wednesday night twilight sails, where sailing is cunningly mixed with long evenings and beer, have finished for the season, but be sure to pop them in your diary for next year. Other sessions, however, are still running. There has been a market in Hoxton since 1687, and today it's still going strong. The Saturday market is a particular gem, with scores stalls selling everything from eels and fresh vegetables to sweets and clothes. 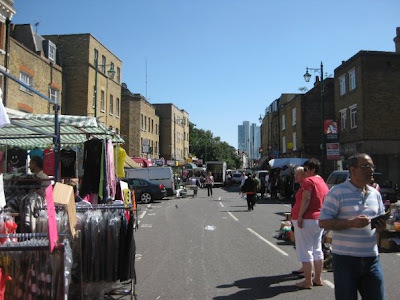 Unlike other more gentrified markets in the area, Hoxton Street Market has retained its East End charm, and still offers up a range of food, fruit and veg, clothes and footwear, alongside a range of things including household goods and toiletries. 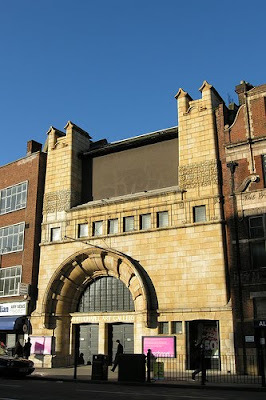 The market, and its distinctive arch, are a short distance from Old Street Tube, and it runs from Monday to Saturday, with Saturdays being busiest. It is held on Hoxton Street, N1 and runs from 7.30am to 6pm. 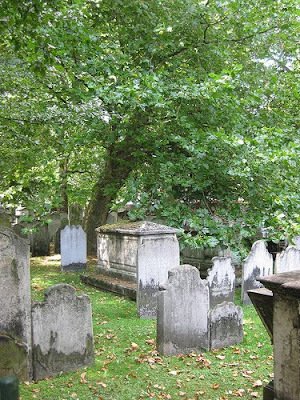 London is so densely packed that often some of the wildest spaces, especially in the centre, are graveyards, and Bunhill Fields on City Road underlines this. The name is supposedly derived from 'bone-hill' and, though the area was originally much larger, only four acres of the remain, containing the graves of many nonconformists who died between the late seventeenth century and the middle of the nineteenth century, though it was probably used for burials from Saxon times onwards. The graves of many notable people are here, including John Bunyan, author of Pilgrim's Progress, poet and painter William Blake and Daniel Defoe, author of Robinson Crusoe. The 1852 the Burial Act allowed for the closure of burial grounds such as Bunhill when they became full, and the final burial took place in January 1854. By this time around 120,000 people had been laid to rest on the site. The future of the site looked uncertain, but following much campaigning an Act of Parliament was passed in 1867 "for the Preservation of Bunhill Fields Burial Ground... as an open space", and it remains open as a community garden today. For more information, visit the page on the City of London Website. 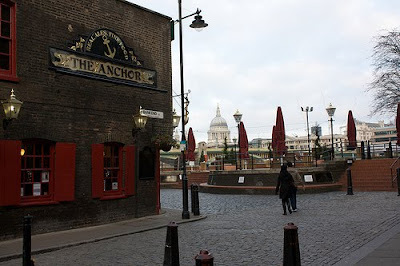 A little bit of a stretch of the truth in this post title, but the Mayflower in Rotherhithe is only a stone's throw from the quay where the ship the Mayflower docked in London before its departure with the Pilgrim Fathers for the New World. In reality, the current pub wasn't even there at the time the Mayflower docked in 1620, and it visited a number of other places including Southampton, Dartmouth and Plymouth before making its final voyage, but there was a pub on this site at the time, and the connection is enough to draw in a fair number of American tourists. The pub is a bit overpriced, and a bit of a tourist trap, but it does offer the opportunity to dine on a jetty overlooking the Thames (except for a few minutes either side of high tide), and is a pleasant enough spot. Bike riders beware, however, as part of your author's bike was stolen last weekend when he locked it up right outside the door. The website is down, so for more information, why not try the Standard Website. The Scootercaffe, which everyone knows as Scooterworks, on Lower Marsh in Waterloo, is an accidental cafe with a considerable amount of charm. The cafe is owned by Craig O'Dwyer, a New Zealand Scooter specialist and coffee machine collector, who began Scooterworks Ltd after arriving from New Zealand 16 years ago as a scooter and parts shop. When staff began serving occasional cups of coffee to customers from an Italian 1957 Faema espresso machine, the coffee was so good that soon people were coming from miles around. Nowadays, the actual Scooterworks workshop itself has moved to Bermondsey, leaving a lovely little bar and cafe with a mixed clientelle, and a very pleasant atmosphere you rarely find in somewhere so central. It even has a nice little yard at the back for sunny days, and a basement bar with live music every Tuesday and Wednesday night. Whilst they don't serve food, customers are welcome to bring their own food and have a picnic, as long as they take their rubbish with them. Scooterworks is open Monday to Thursday 8:30-11pm, Friday 8:30am-midnight, and Saturday 10:00am-midnight. It's closed on Sundays. Your author is a fan of pop up bars, even if they are covered in branding. So when he was invited along for an evening of learning about gin at the Bombay Sapphire Dusk Bar last week he was more than happy to oblige. The bar sits on the terrace at Somerset House, and all the features are designed by celebrated industrial designer, Tom Dixon. The drinks are firmly gin-based, with a cocktail menu developed in association with some of London's top bartenders, and a new one every 3 weeks. It's very pleasant, especially at dusk, though your author must warn that he was entertained courtesy of the kind people at the aforementioned gin company, so he can never remain truly objective. However, if all this sounds like your sort of thing, be sure to pop along soon, as the bar is only open until 18th October. For more information, visit http://www.bombaysapphiredusk.com. The Old Royal Naval College, in Greenwich, is a fantastic site, and one of its most celebrated features is the Painted Hall. Planned as the hospital's dining hall, the hall was designed by Wren in 1698, and the roof and the dome above were completed by 1703. The hall was decorated by Sir James Thornhill with the theme of the triumph of Peace and Liberty over Tyrany. Whilst Wren's building was completed relatively swiftly, Thornhill's paintings took a lot longer, and he ended up spending nineteen years completing the work. Legend has it that he was so confident of his abilities that he said he should only be paid what his paymasters thought his work was worth, and they consequently held back from any form of payment for a considerable amount of time. Eventually, however, Thornhill secured a payment of £1 a yard, and he went on to become George I's court painter, a fellow of the Royal Society, and eventually was elected to Parliament and knighted. Clearly, therefore, it was worth the risk! It was in the Painted Hall that the body of Admiral Lord Nelson was brought in January 1806, following his death in the Battle of Trafalgar, after which it became an art gallery, and eventually returned to use as a dining hall, remaining in daily use until the Royal Navy's departure in 1998. Christ Church Spitalfields, on Commercial Street close to Brick Lane and Spitalfields Market, was designed by Hawksmoor and built between 1714 and 1729. In 1711, an Act of Parliament was passed which required the building of fifty new churches to serve new populations on what were then the fringes of London, and this church was one of the results. Christ Church served the East End for many years, but by 1957 it was basically derelict. It was saved from demolition by the Hawksmoor Committee, and by 1966 funds had been raised for the roof to be rebuilt, partially through money raised by the sale of St John’s Smith Square. 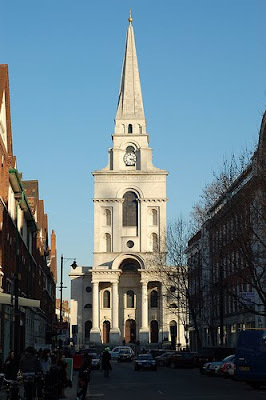 In 1976, the Friends of Christ Church Spitalfields was formed to restore the church, and services resumed in 1987. The portico at the west end was repaired and cleaned in 1986, and the tower and spire were restored by 1997. The south façade was cleaned in 1999, revealing the whiteness of the Portland stone. The north and east façades were repaired and cleaned in 1999–2000, and the interior was restored by 2004. So now, it's all back in working order. It's a beautiful church, with a lot of character, and has attracted many admirers. In fact, your author once heard a lovely tale about a scruffy looking artist type approaching church staff to ask if they could organise a special tour her friend Dave, as he was a big Hawksmoor fan. Rumour has it that the artist in question was local resident Tracey Emin and her friend Dave was none other than David Bowie. For more information, see the Friends of Christ Church Spitalfields website at http://www.christchurchspitalfields.org. 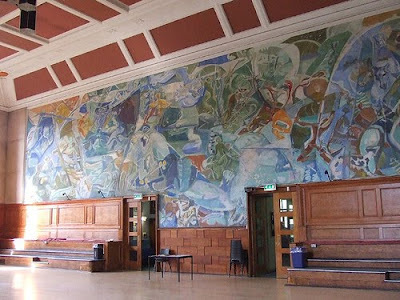 Cecil Sharp House, just North of Regents Park, is the home of the English Folk Dance and Song Society. The Society formed in 1932 when the Folk-Song Society and the English Folk Dance Society merged. Today, the society holds regular dances, concerts and other events at the House, and there are also regular music, song and dancing classes. These include Celidhs, barn dances and folk clubs, many suitable for all abilities from absolute beginners to the advanced, and all for a reasonable fee. And if you don't want to dance but still fancy seeing the building it's even open today for Open House. For more information, visit http://www.efdss.org/. 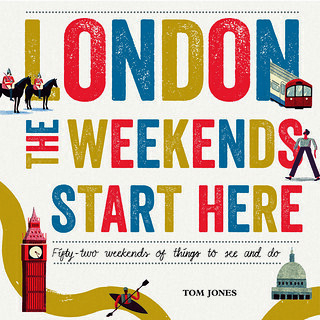 You must have been asleep if you've missed the upcoming Open House London weekend. Now in its 17th year, the weekend is a 'celebration of design excellence', opening more than 700 buildings of all sizes and shapes around the capital this Saturday and Sunday for free. Some of the not-normally-open-to-the-public gems which caught your author's eye include 23 Brook Street, Jimi Hendrix's former pad, HM Treasury, Channel 4, the Argentine Ambassador's Residence, BBC Bush House, the Houses of Parliament, City Hall and the Reform Club, but there are hundreds on offer. 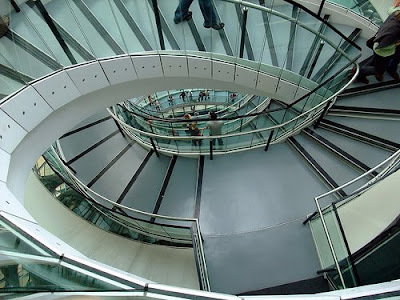 Your author has plans this weekend, and a bit of history with London Open House, so as it stands he'll probably just try and see what he can, though he understands that queues and early bookings for some of the best buildings can be an issue. 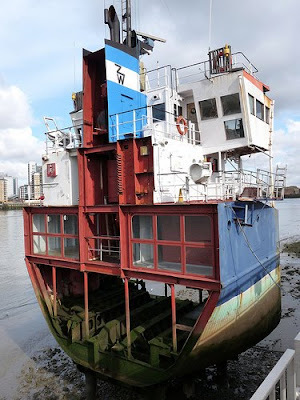 Richard Wilson's Slice of Reality sculpture, beside the Millennium Dome in Greenwich, is a slice straight through a ship which was commissioned for the Millennium and remains in place, mounted on the river bed. Quite what it can be used for now, your author is unsure but the Greenwich Phantom seems to recall seeing furniture and instruments in it in 2000, and your author is sure he has seen it referred to somewhere as the Slice of Reality Youth Centre. Your author hasn't covered the Whitechapel Gallery since it properly reopened in April, but he has been and it is a welcome improvement to what was already an excellent gallery. Founded in 1901 with the aim of bringing great art to East London, the gallery is Grade II* listed and was designed by architect Charles Harrison Townsend. The two year £13.5m expansion project has doubled the size of the Gallery by incorporating the building next door, which has significantly increased the options the gallery has for exhibitions and events. The Whitechapel Gallery prides itself on its education and outreach programmes and as a result there are always a number of films, talks, courses, concerts and events on offer, so have a look at the website if you're looking for more than just art. If you're hungry, there is also a decent-looking restaurant (a bit beyond your author's means) on the ground floor and a nice cafe upstairs. Or if you're looking for an event space, that is also an option. Your author has touched on second hand clothing shops before, and one of the better ones in town is Beyond Retro on Cheshire Street a short distance from Brick Lane. Sure, here is where you will see East End posers in their purest form but there are a vast amount of items available in their 5,000 square foot warehouse store, once a dairy depot and, since 2000, home to around 15,000 items of clothing, with a further 500 more pieces each day. Or if you can't be bothered to travel to Shoreditch, there is a smaller store at 58-59 Great Marlborough Street, in Soho. There is also a new store opening in Brighton and a number in Sweden. For more information, visit http://www.beyondretro.com/. Keats House, in Hampstead, is the house where John Keats lived from 1818 to 1820. The house is now a museum about Keats and has recently recently undergone a major restoration project. It is said that the years he spent at the house were amongst his most productive as a poet, possibly because he fell in love with Fanny Brawne, the daughter of his neighbour. It is said that he wrote "Ode to a Nightingale" under a plum tree in the garden. 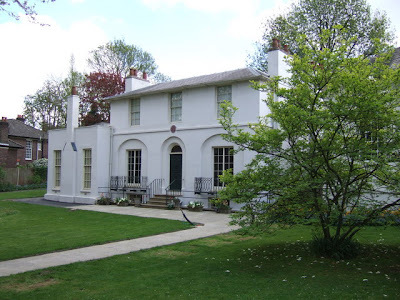 The Keats Museum is open to the public daily (except Mondays) at a cost of £5. 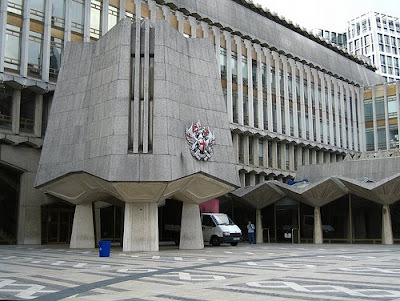 For more information, and opening times, visit the page on the City of London Corporation Website. 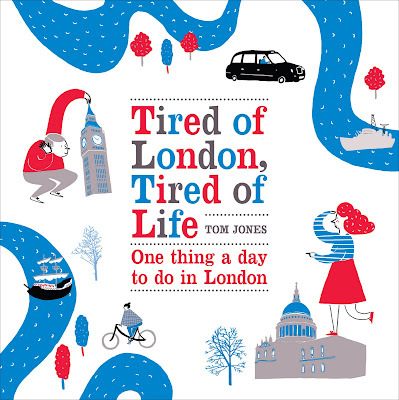 A frequent criticism by your author's peers is that he is too East London centric, but he likes to think he does a good job of covering much of the city, and there is always room for them to start their own blogs. So, today's idea is a drink at the Dove in Broadway Market. It's a very pleasant little pub, specialising in belgian beers, but with ales and other drinks on offer, and also serves Thai and English foods. As with anywhere in the general area (which some Urban75 contributors refer to as w*nk city central) it has to be approached in the knowledge it will be full of East London posers, who are generally more worried about their hair than a good pub and a chat, but nevertheless it is still a good place to while away an evening. The Barbican Library, in the Barbican Centre, has a wide range of events on offer which are great for London geeks, and generally about £5. In the next month or so, you can learn about various aspects of Dr Samuel Johnson, attend an exhibition of contemporary basketmaking or even pop by the Barbican Library Autumn Fete, on the evening of Friday 23rd October. 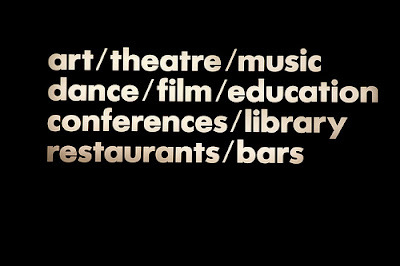 Most events are in the evening or at weekends, and you can get tickets where applicable from the Barbican Centre Box Office. For more on the Library click here, or for full events listings click here. 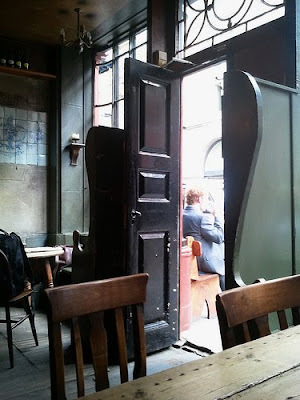 Your author doesn't pretend to be a 'foodie', so if you're fussy you may disagree, but he loved The Passage Cafe, on Jerusalem Passage in Clerkenwell. It is a lovely little French bistro run by Katarina and Pascal Brunet. Reasonably priced and small enough to warrant a clichéd term like 'intimate' the cafe overflows onto the street and the waitress, who your author can only assume is Katrina, rushes around in an attempt to make everyone feel like they are very important, and achieves her aim very well indeed. Mains are all about a tenner, and are very tasty, and it has a nicely French atmosphere, with the walls sporting a good mix of Toulouse Lautrec prints, vintage Ricard ads and various impressionist prints. Built on the site of a medieval tavern of the same name, the Jerusalem Tavern in Clerkenwell is the only pub owned by the Suffolk based St Peter's brewery. It's a gem of a place, serving a range of ales in a pleasant little pub, and often on the pavement outside. It's also a rather social little pub, where it's easier than most places to strike up a conversation with the happy customers. Named after the Priory of St John of Jerusalem, founded in 1140, the current Tavern building dates from 1720. 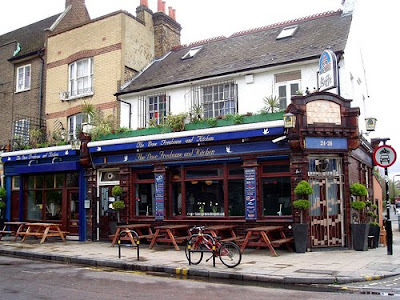 Your author agrees with the website blurb that it is one of the finest pubs in London and is pleased to report that it was voted 2009 Town Pub of the Year by the Good Pub Guide. Built in 1909 as the 'Maida Vale Roller Skating Palace and Club', The BBC's Maida Vale Studios are still going strong, despite rumours of their closure back in 2007. The home of the John Peel Sessions, and huge amounts of other output from BBC Radio 1, BBC Radio 2, BBC Radio 3 and BBC Radio 4 from 1946 to present still stand on Delaware Road in Maida Vale, and are still the home of much of the BBC's live music output. Countless top pop bands have used Maida Vale, and even the Beatles used studio 5 a number of times in the sixties to record BBC radio sessions. Other visitors include David Bowie, Led Zeppelin, Jimi Hendrix, The Clash, The White Stripes, Belle and Sebastian and Hefner, and just about anyone else you can think of from modern pop music. That's right! Massive bands like Hefner! The space that Zane Lowe annoyingly refers to as 'Maida Vegas' (cringe), consists of a number of areas including: MV1, one of the largest recording spaces available in the UK, MV2 a rehearsal space for the BBC Singers and BBC Symphony Chorus, MV3 a large studio used for BBC Radio 2 session recordings and live audience shows, MV4, a smaller studio which was home to the Peel sessions, MV5 often used as the Jo Whiley Live Lounge and MV6, a drama studio used by BBC Radio 4. Housed in the modern buildings surrounding the Guildhall, the administrative centre of the City of London Corporation, the Clockmakers' Museum houses a collection of clocks collected by the Worshipful Company Of Clockmakers since 1814. The collection is free, and has been open to the public since 1874. It houses a range of timepieces dating mainly from the 17th to 19th Centuries. Relaunched in 2002, the museum tells the history of clockmaking in London, and also includes some modern clocks to demonstrate the art in the modern day. It might not be your sort of thing, but your author trusts his grandmother, who says it is worth a visit. The Museum is open from Monday to Saturday, 9.30am until 4.30pm, though access is briefly limited during clock winding times. For more information, click here. The BBC has declared Beatles Week, to celebrate a new load of clips they've cobbled together, so what better time to reflect on the London lives of the band? 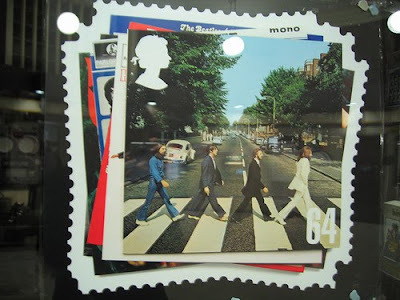 Well apart from the obvious Abbey Road zebra crossing, London Beatles Walks can also take you on a tour of other sites in our fair city including the Apple Corps Building at 3 Saville Row where the band recorded parts of the Let It Be album, and performed their 'rooftop session', their last ever gig. You can also see the former Apple Boutique at 94 Baker Street, Marylebone registry office in Marylebone Road, where Paul McCartney married Linda Eastman, and Ringo Starr married Barbara Goldbach, Ringo's former basement flat at 34 Montagu Square, where John and Yoko lived temporarily and where the 'Two Virgins' picture was taken, and the the house where Paul lived with Jane Asher, and where John and Paul wrote I Want To Hold Your Hand. And if that isn't enough, did you know there is a Beatles Coffee Shop on Abbey Road, or a Beatles Store on Baker Street? Whilst the Tate Modern is situated handily on the South Bank, a short walk from St Paul's and London Bridge, it can sometimes be a bit more of a trial to get to the Tate Britain. 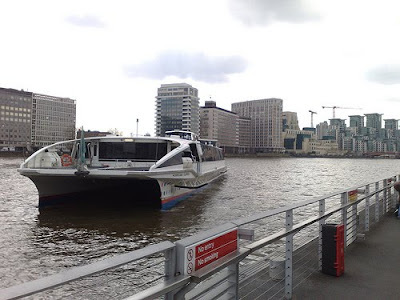 The people at the Tate have long been conscious of this, however, and have teamed up with Thames Clippers to run frequent boats, with interiors and exteriors designed by Damien Hirst, between the two galleries. Mary Poppins knew how to have good honest fun. "With tuppence for paper and strings...You can have your own set of wings", we were told. Then she and and the Banks family headed out into the park for what was an unrealistic amount of fun even for the period. Nevertheless, there is something very pleasant about kite flying and, whilst nowadays kite flyers will find a market flooded with flashy kites with many knobs and whistles, and will probably buy their kite, a simple kite can be picked up fairly cheaply, and you can still make your own. 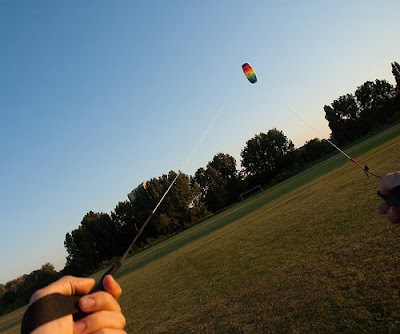 Top London flying spots include Hampstead Heath, Primrose Hill and Blackheath, but there are many places in our fair city where you can find enough room to launch a kite, although you should bear a few handy tips from the Kite Society in mind. 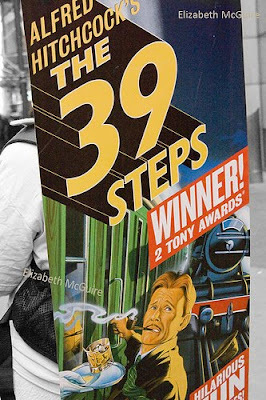 The 39 Steps, currently at the Criterion Theatre on Piccadilly Circus, is a play adapted from the 1915 novel by John Buchan. Winner of the Olivier Award for Best Comedy in 2007, and nominee for the 2008 Tony Award for Best Play, amongst other awards, the well known story tells the tale of Richard Hannay and his attempts to expose a plot to steal vital British military secrets during the First World War. Your author tends to steer clear of theatre reviews, not least because he is a bit of a Philistine when it comes to the performing arts, but this is just about light hearted and fast moving enough to keep his attention, and the limited cast do an excellent job of keeping the plot entertaining and amusing. Samuel Pepys is now best known for his diary, which recorded life in 17th Century London, and is particularly notable for its record of the Great Fire of London in 1666. In it, he said that during the fire he took refuge in "a little alehouse on bankside ...and there watched the fire grow", and the pub in question was reputed to have been the Anchor on the South Bank. Whilst it's not a particularly amazing pub, it has recently, along with the riverside terrace undergone a reported £2.6m refurbishment by Punch Taverns, and as the summer evenings slip away from us its another place best enjoyed now if you don't want to have to take a warm coat or wait 'til 2010. Whilst Pepys was later to become a Member of Parliament and Chief Secretary to the Admiralty, the diary records the ten years from 1 January 1660, covering his life, love, friends and dealings. 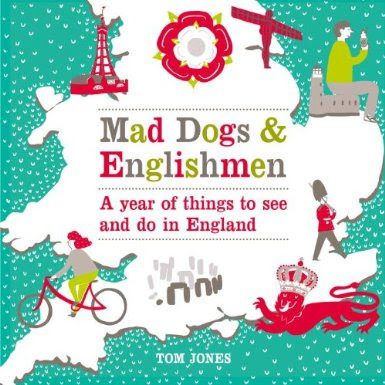 It is widely regarded as an important account of London in the 1660s, and is a particularly important first hand account of the fire. For more on the Anchor click here and for more on Pepys click here. 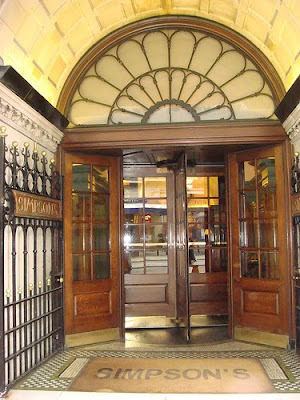 Simpson's-in-the-Strand, beside the Savoy Hotel, was opened in 1828 as a chess club and coffee house called The Grand Cigar Divan. It went on to establish a reputation as the "home of chess", attracting everyone who was anyone in 19th century chess. Famous customers have included Vincent Van Gogh, George Bernard Shaw, Benjamin Disraeli, William Gladstone and, of course, the man who seemingly ate at every London establishment at one time or another, Charles Dickens. The restaurant specialises in traditional British fare, and joints of meat are delivered to tables on silver-domed trolleys and carved there. In fact, so much part of Simpson's is this that they offer weekly 'carving classes', admittedly at a hefty cost £150, on Sundays throughout the year. Under the tuition of chef Gerry Rae, student carvers receive a 90 minute lesson, practising on a variety of joints, and are then given a presentation carving knife and fork, a certificate of competence and lunch. Following this, friends and family of the student are encouraged to come for post lesson lunch where the carver can show off their new skills. Guy Richie owns a pub in West London, and that's today's idea. 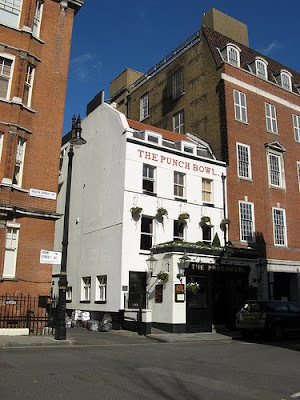 Built in the 1750's, the Punch Bowl is the second oldest pub in Mayfair. At the time of going to press, rumours of a two tier pricing system for mockney gangster types were found to be unsubstantiated.